Boats lie in dock at Arbroath Harbour, Scotland. Arbroath's annual Seafest is supposed to celebrate its maritime economy. But thanks to North Sea fishing quotas, the town of 20,000 on Scotland's rugged east coast has very little maritime industry left to celebrate. Arbroath's once-bustling port saw the final boat of its erstwhile fleet of 37 fishing vessels sold earlier this year, and the headquarters of the Arbroath Fishermen's Association will shortly be turned into apartments. Still, some 30,000 people turn out for the festival each year, drawn in search of the sense of community and pride the fishermen  local heroes  once hauled ashore with each gleaming catch. Small, all-but-forgotten towns like Arbroath capture in microcosm the tensions facing modern Scotland. Arbroath's hearts are tugged to the past, to tales of sea-faring greatness and also the Scottish identity-shaping myths of thwarted nationhood and lost sovereignty. An abbey overlooking the harbor holds the Declaration of Arbroath, a letter signed by local noblemen in 1320 demanding independence for Scotland. (The document is said to have inspired America's own Declaration of Independence). The dominant political party in Arbroath is the Scottish National Party (SNP), a left-leaning party that wishes to declare independence from the United Kingdom by disbanding the 1707 Act of Union between England and Scotland. But European integration rather than nationalist fervor remains the source of the town's economic success  despite the demise of its traditional livelihood, Arbroath's unemployment is falling and its wages rising at rates above the national average. Indeed, Arbroath has begun to flourish as a result of investment from the very institutions that decimated its traditional economy. The European Union's Common Fisheries Policy ran Arbroath's fishermen out of business; and E.U. agricultural policy for years made it impossible for local farms to compete. But local agriculture has recovered by accepting an influx of cheap labor from Poland and other new European states. Arbroath's harbor has been regenerated by $2 million in E.U. grants that have turned its once-forbidding granite docks into a recreational marina with berths for 58 yachts  and a waiting list for more. 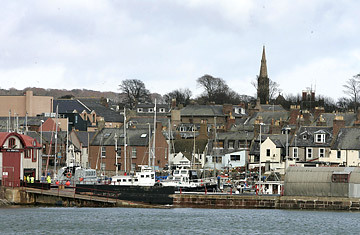 Even the final surviving vestige of Arbroath's fishing industry  a locally cured haddock marketed as the "Arbroath Smokie"  has been bolstered by a Protected Geographical Indication from the European Commission, a similar status that protects sparkling wine from France's Champagne from imitators elsewhere. Such local successes, engineered by the SNP, have helped the nationalist party win control of Scotland's regional parliament, and boosted its chances of winning a referendum on independence it has promised to hold by 2010. Andrew Welsh, the town's SNP representative in the Scottish Parliament in Edinburgh, has a copy of the Declaration of Arbroath on his wall and, if pushed, will wax lachrymose about great Scottish kings like "William the Lion" and "Scotland's right to rebel against tyranny." Yet, he's far more interested in explaining how he helped secure a new road linking Arbroath to the nearby city of Dundee, which has brought young professionals to live here and given locals better prospects for commuting to a larger job market. "We are practical people," Welsh says of the Nationalists. "You win hearts and minds by producing policies that help the local need. It's not a question of nationalism or separatism, but showing that we can deal with issues on the ground." Success in modern Europe, however, often comes at a price of diluting local tradition. Where once the launch of a new fishing vessel would have drawn hundreds of locals in their Sunday best to the quayside, the big draws at this year's Seafest were not fishing vessels but Viking warrior re-enactments, candy stores, carnival rides and a palmist called Amalia Lavengra. The largest boat in the harbor was not some weathered trawler, but the Donara II, a 34-foot yacht owned by Andy Stewart, Commodore of the Arbroath Sailing and Boating Club. "It's mixed emotions," says Alex Smith, a former Arbroath fisherman who sold his boat last year, and who offered "Pleasure Cruises with Skipper Alex Smith" on a small craft during this year's Seafest. "It's good to see the harbor busy. But Seafest is supposed to be about fishermen, and there's no fishermen left."